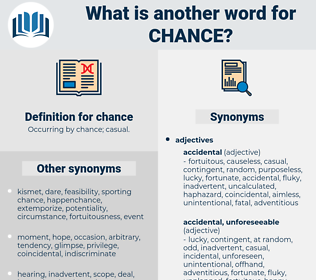 What is another word for chance? put eggs in one basket. Lectures, shot, choice, adventitious, expectation, way, blessing, chanceto, hope, break, moment, hypothesis, success. coincidence, option, accident, eventuality, randomness, scope. predictable, calculation, premeditated, certainty, appointment, ordinance, law, foreseen, fate, decree, Prepense, predestined, sure, volunteer, plan, willful, Ordainment, preordained, provision, intention, purpose, inevitable, necessity, unforced, certain, fixed, preparation, destined, foreordained, foreordination, prescribed, expected, predetermined, premeditative, knowing. surety, safeguard, protection, safety, disadvantage, loss. reality, design, scheme, aim, unlikelihood, bad luck, truth, assurance, misfortune.
" No; there's no chance. No. Haven't had the chance. shot, fresh start, clean slate, street, room, day, say, throw, brass ring, tabula rasa, audience, occasion, hearing, crack, hunting ground, opening. occur, hap, pass, come about, take place, go on, pass off, fall out, happen.